Our home is our castle. At home we can do whatever we want: print full-color photos, color images, print results of our experiments. 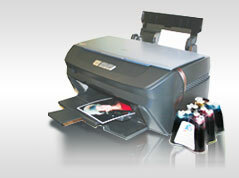 The jet printer allows doing high-quality color prints. And compatible consumables: continuous ink supply system (CISS) or refillable cartridges (RC) allow making the printing process not only pleasant and qualitative, but also a low cost undertaking! From now on, ink expenses for 1 photo (10*15 cm) constitute only 0,02 cents! Print with pleasure with high-quality consumables of INKSYSTEM Company!